Hopefully you know that Enterprise Office 365 suites have a video portal facility built right in, kinda like YouTube for the Enterprise. I wrote a post a while back on Office 365 video embedding. It was a bit of a hack to be honest since Office 365 didn’t at that stage expose the HTML embed code. That’s all just changed! 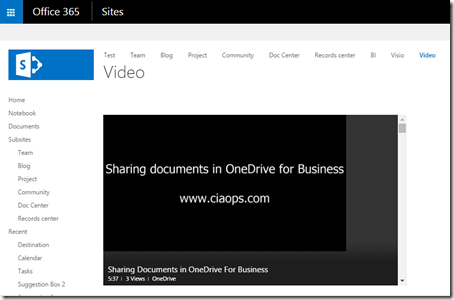 If you now look in the top right of any video in Office 365 you see the Embed link as shown above. Selecting that will open a new dialog that provides the embed code. Simply copy this. 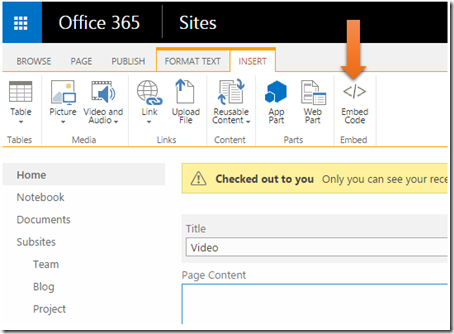 Go to the location in SharePoint where you wish to display the video, edit the element, select the Insert tab at the top of the page and then select the Embed code button right of the Ribbon menu. Paste the embed code into the box that appears. Immediately, you should see a display of he video below as shown above. Select the Insert button to save the changes. Then save the element you are editing. Now the video should be visible in the element as shown above (here, just a normal page). The answer to your very next question is that at this stage is, no, you can’t publically (i.e. 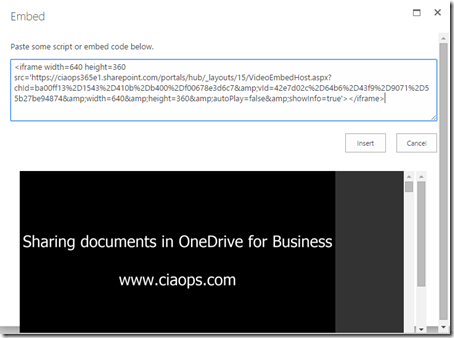 without an Office 365 login) share videos from Office 365 video, even using the embed code. However, as I understand it, that ability is coming so stay posted for updates.